We knit, we craft, we celebrate!!! It’s been more than a week since we celebrated yet another birthday in FMKG – our Friday Morning Knitting Group.This time it was Karen K…we also celebrated new craft ideas as well as sharing our Stitches West experiences. Several of us swore, including me, that we would simply window shop…but I believe but all but one of the Stitches attendees came home with at least one more project to knit. I felt really successful because I only came home with one of the four projects that I coveted. How many would I have really coveted if I wasn’t working in MaggiKnits booth? I only spent about an hour on the market floor over 3 1/2 days. Ohhhh…..I did come home with another knit book – “The Knit Stitch Pattern Handbook” by Melissa Leapman. One can never have enough books….right? I will share more about my projects and this wonderful knit book in another post. Now it’s back to FMKG. Kimberly is all knitted up! 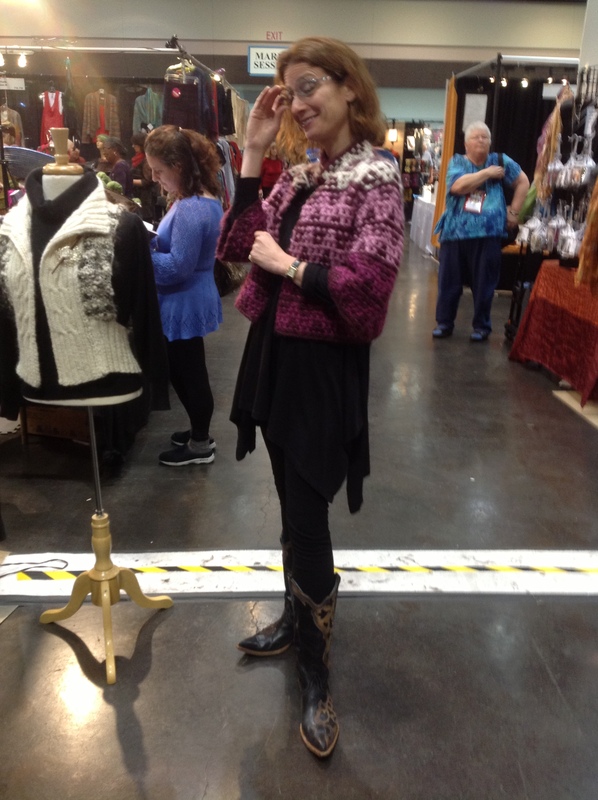 It’s preview market night….there is a line to enter the market floor…..knitters are every where! I capture the beginnings of the crowd and burst into glee when I realize Melissa Leapman, one of my favorite people/instructors, is part of that crowd. Thursday night was busy, Friday was over the stop. We – Maggie, Heather and I – barely stopped all day. Some of the Friday workshop group met for drinks and dinner Friday night….great fun but no photos…one of us was sick and it didn’t seem right to shoot photos. It was so great to so many old friends while retailing in Maggi’s booth…..I didn’t capture everyone on film. 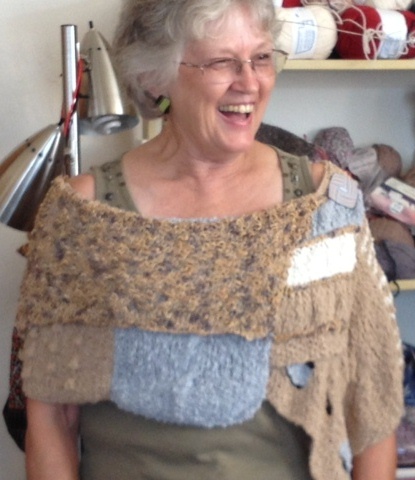 It was great to see Shelli from Knitterly in Petaluma and Liza Souza….both every so briefly but glad to connect. I do love our knitting community. Oh…..and I did buy something (if you look closely at the photo of Lyn from Cabin Fever/Shetland Yarns you will see the model)….only one thing but it was a kit that I couldn’t resist. The show is winding down!